December, 2015 | H&R Group K.K. The First Month of the Year, Kansai Style! With the holidays over and the winter cold setting in, it can be difficult to find reasons to leave your house in the first month of the new year. Fortunately for people living in the Kansai region, there are too many exciting traditional events and festivals in January to risk missing by staying home. Whether they’re a day-trip distance away or in your neighborhood, there’s sure to be enough activities to keep your calendar full and your post-holiday blues subdued. Ebisu is the patron deity of commerce and fisheries, and for three days in January, a lively festival is held for people to come to Ebisu shrines all over Japan and pray for success in business. Kansai is the most popular region for the Ebisu Festival because for many years the area was the commercial and trading hub for the country. The largest and most prominent festival occurs at the Imamiya Ebisu Shrine in Osaka from January 9-11. The main festival day is January 10, where visitors can enjoy sea bream from the morning market before watching the Good Luck Palanquin parade. Be sure to purchase a good luck bamboo branch or other lucky souvenirs! Being the oldest hot spring in Japan is a title that comes with many customs and traditions to be upheld. One such tradition occurs every year in January at the famous onsen in Kobe. On January 2, various ryokan owners travel from Arima onsen to the cultural auditorium dressed as traditional bathers, Buddhist monks, and Shinto priests. In the ceremony they churn the waters of the onsen until they are the correct temperature to start out the new year. Enjoy this cultural ceremony while relaxing in the beautiful nature of Arima! Regardless of where you are in Japan, exploring your city center during the coming of age day festivities is a must. Travel to the city hall building starting at noon to hear some well-wishes spoken by city officials to the new adults of the community. Following the initial ceremony and speeches, many photographers and families walk around downtown interviewing the new adults and taking pictures of them in their fancy ensembles. It is a lively and festive day that shouldn’t be missed! This year’s festivities will be held on Monday, January 11. In addition to the standard coming of age day celebrations, there are also a few traditions that occur around the holiday in the spirit of entering adulthood. Most involve adolescent boys partaking in some display of power or competition, and there are a few entertaining examples occurring around Kansai in January. In Osaka, young men dressed only in loin cloths engage in an exciting and energetic fight to maintain possession of a sacred amulet. 1,000 archers line up at the Sanjusangen-do Temple in Kyoto to shoot their arrows at a target 150 meters away. It is popular belief throughout Kyoto that eating red bean rice porridge (azuki-gayu) when the new year begins will ward off illness and help you maintain health for the year to come. The dish is commonly eaten at Zen Buddhist temples, and if you partake in the festivities you can try some for yourself! Though the exact origins are unclear, this festival, which has been taking place in Nara for hundreds of years, is an incredible sight to see. The day starts around noon at a few temples surrounding Nara park, but things really heat up in the evening with fireworks and a huge mountainside bonfire. Just before sunset, a group of locals start a procession that ends at the base of Mt. Wakakusayama where viewers can gather to watch them light the mountain on fire. The firey view can be seen from many places in the city, but the most action occurs at the mountain’s base. Make sure to be alert during the ceremony; though the flames are massive, they usually do not last long! Japan is rightly lauded for being a nation of amazing food. From sashimi to sushi, from nabe to bashimi, there is so much to taste here. However, wasabe and Taiwan Ramen aside, it doesn’t really do much in the way of strong, spicy flavours. Which is why, for those of you who are ‘heat-heads’ like me, who enjoy the fiery burn of the chilli spice, it is great that there are so many fantastic Thai restaurants around the city to help quench that desire for food that will will make you sweat. 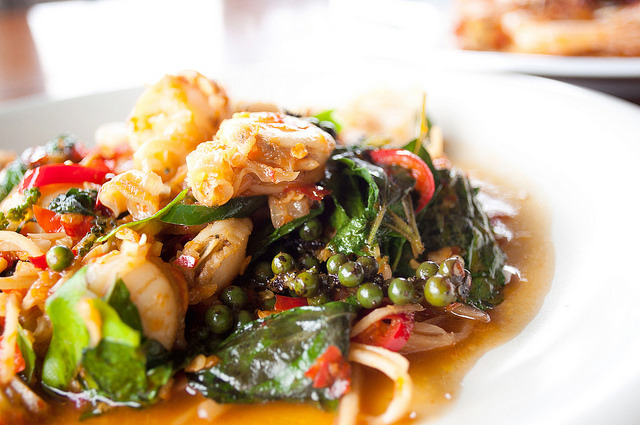 Despite being underground, Montee is lauded for being Thai street food at its finest. If you can find it within the labyrinthine subterranean Chikagai shopping and restaurant complex of Asakusa, Montee is a true Thai dining experience. Marked out by its striped tricolor flag and giant inflatable Singha beer bottle, its decor is just the right side of stereotypical to be almost as authentic as the food is. Spice levels are marked from one to three, but the one is still pretty spicy! Ban Thai takes a step away from the ‘street food’ vibe of Montee, and instead goes for a touch of elegance and class. Prices tend to reflect this more upmarket approach, but having been in Shinjuku for more than twenty years, you can be assured of its quality. Most staff are Thai, and the food, while liberally spiced, is moderated towards Japanese tastes. At nearly 25 years, Rice Terrace is also another longstanding Tokyo institution. Tucked away on a little alley behind Nishi Azabu, it was renovated in 2014 from a two story house and evokes the Thai countryside, with the sunshine streaming in through the roof. The food is fragrent and created by a chef who learned his trade working for fifteen years at the world famous Royal Orchid Sheraton hotel. Lunch menus are available. Over in Ikebukuro, Phrik is a tiny little family run restaurant. While it doesn’t have the elegance of Ban Thai or the gaudiness of Montee, it does have the authenticity of great food, and the convenience of being open until 3:30 am. Modest and not flashy, it also has a small Thai foods grocery store attached, so if there is anything you particularly enjoy you can buy it and try making it yourself. If you are in Meguro you can find Keawjal (please don’t ask me to pronounce it), a consistently good Thai restaurant. It serves “Imperial Thai” cuisine, and is located near the embassy, which certainly feels like something of a stamp of approval. On nice, sunny days, you can take advantage of the outdoor seating, and it may feel just like being in Bangkok. Japan is right at the top of the list of world countries facing the most danger from earthquakes. Geologists will explain about the subduction of the restless Philippine Sea plate that lies beneath the Okinawa plate and the Amurian plate that triggers high-intensity earthquakes. Many cities of Japan carry sad memories of earthquakes that have ravaged their region. Kobe’s tragedy began at 05:46 on the morning of the 17th of January 1995. The epicenter of what would become known to history as the Great Hanshin/Awaji earthquake was at the northern end of Awaji Island, 20 kilometers south of the Kobe waterfront. The seismic event lasted only 40 seconds but was more powerful than the typical Japan earthquake because it occurred along an active fault line. These “inland shallow earthquakes” are extremely fearsome since they begin so close to the earth’s surface. In Kobe, the overhead Hanshin Expressway toppled and more than 150,000 buildings were destroyed. Of the 150 quays in the Kobe port – the sixth largest container port in the world – 120 collapsed. Almost one-quarter of the central business district was rendered unusable. The rebuilding bill was more than ten trillion yen, which represented 2.5% of the country’s gross domestic product in 1995. But far worse was the human toll. 6,434 people were killed – most in their houses that pancaked when heavy roofs, installed to help withstand typhoon winds, collapsed. The Great Hanshin/Awaji earthquake was the worst to strike Japan in seventy years. Some good emerged from the disaster. As a country, Japan had little volunteer culture before the Kobe earthquake. But the destruction was on such a massive scale that an estimated 1.38 million people donated their time to help rebuild the city. Since then grass-roots activism and volunteerism have become ingrained in Japanese life. The power of the Great Hanshin/Awaji earthquake – the first ever to register a magnitude greater than 7.0 – also shook up the country’s civil engineers. Disaster prevention became a national priority. For instance, rubber blocks were installed in buildings to help absorb shock. Before 1995 was out, the Japanese government declared that the 17th of January would be “Disaster Prevention and Volunteerism Day” going forward. Two decades later, Kobe has not forgotten. The establishment of the Disaster Reduction and Human Renovation Institution in 2002 spawned the Earthquake Memorial Museum (1-5-2 Kaigan-dori, Wakinohama, Chuo-ku, Kobe) that educates visitors about the tremors that plague Japan and what can be done to prevent widespread disaster. The recovery of the Kobe people is captured in a documentary film and interactive games teach future generations what they can do to minimize the impact of earthquakes. Higashi-yuenchi Park became the site of the Earthquake Memorial Monument with the installation of the 1.17 Light of Hope monument to symbolize the reconstruction of the city. A further remembrance of the victims occurs for two weeks in early December when 200,000 hand-painted lights illuminate the streets during the Kobe Luminarie. On Awaji Island, the Hokudan Earthquake Memorial Park preserves evidence of the deadly Nojima Fault as a national natural monument. Disaster preparation and awareness is stressed to visitors who are shaken for 40 seconds at the site to simulate the strength of the Great Hanshin/Awaji earthquake. The Port of Kobe Earthquake Memorial Park has saved a segment of the Meriken wharf that was twisted into ruins by the quake, telling the tale with models, movies and photograph exhibits. Japan hosted the first ever Winter Olympics staged in Asia at Sapporo back in 1972, and the country has a rich history of playing on its frosted mountain slopes. You won’t find the world class ski runs of Nagano and Shiga at Mount Rokko, the series of 1,000-foot high peaks overlooking Kobe, but the easy ski slope of the Snow Park is ideal for beginners and young families. The lighted facility stays open until 10:00 p.m. every night beginning in early December and skis, sleds and snowboards are available for rent through mid-March. Mount Rokko supports three runs, all short and none very steep. On weekends, when the slope becomes more crowded, snowboarders cannot flash their skills until after 4:00 p.m., leaving the runs to often inexperienced skiers. A ski school on premises will get even the complete novice started, but advance reservations are required. A diligent staff monitors the potential chaos of clumsy and tumbling skiers to control traffic on the runs. Don’t worry if the Kansai temperatures do not seem so wintry-like. When the mountains are not favoured by a natural covering of snow, the park’s mechanical snow-making machines churn out a reliably deep blanket of snow that can be enjoyed even if the kids just want to build a snowman. And the park mascot, Snoil, is always afoot to keep the good times rolling. Snow or no snow, Mount Rokko is a popular winter destination, reached by a combination of rail, Kobe Municipal Bus, Rokko Cable and Mt. Rokko Mountain Bus. Hikers can ascend a long serpentine path on a steep grade to purchase spectacular views of the cityscape below. One of those eye-poppers is found at the Rokko Garden Terrace that is open 365 days a year so the panoramic vista sweeping from Akashi Strait to the Osaka Plains never closes. The stores at the Terrace do, however, maintain seasonal schedules in deference to the weather. Also closed on Mount Rokko is the Alpine Botanical garden, which shuts the doors to its 1,500 species of hardy cold-weather plant in November and does not open again until mid-March. The Rokko-Shidare Observatory at the Terrace is open year-round although it shutters with nightfall in the winter. This Kobe landmark was cobbled together from plans drawn by Hiroshima-based architect Hiroshi Sambuichi. The open-faced domed structure uses hexagonal frames of native hinoki wood that funnel air inside to an ice room which naturally regulates the temperatures in the building. Sambuichi’s vision was that of leaves gracing a massive tree and in winter those frosted appendages create a striking visual tapestry. A unique indoor diversion on the summit of Mount Rokko is the International Music Box Museum. The collection focuses on exquisitely handcrafted wooden boxes from the United States and Europe that hold cylinders and disks that cranked out the music in the late 1800s and early 1900s before phonographs. The star of the museum is one of the world’s largest dance organs. Two concerts, featuring different musical selections throughout the day, are staged each hour to provide an inviting respite from the winter chill outside. Except on Thursdays; the Music Box Museum enjoys a winter rest on Thursdays from late November until mid-March. In the interconnected world of the 21st century you never know where a cultural phenomenon will spring from. But one of the most unlikely origin stories belongs to “A History of the World in 100 Objects” which resulted from a collaboration between the 262-year old British Museum and BBC Radio 4, a half-century old radio station best known for delivering news bulletins. Their premise was a simple one: tell the story of the progress of human civilization through an examination of the objects left behind. The end product would be an exhibit in the museum and a series of 15-minute radio broadcasts on each object aired over a span of 20 weeks. Execution was another matter. The British Museum is regarded as the world’s greatest depository of humankind, with over 8 million objects in its collection. The oldest, a stone chopping tool, traces back two million years. The whittling process to reach 100 definitive objects involved scores of curators and historians and required four years. The project was finally ready to air on January 18, 2010 and the response was overwhelming. As the BBC Radio 4 series related the story of humanity from two million years forward, listenership swelled. The episodes would eventually attract four million listeners in England and podcast downloads would exceed 10 million, with half of those overseas out of the range of the BBC Radio 4 signal. A best-selling book was published with the objects and their stories. There was also an interactive website where devotees could inspect each object as the series progressed to the 100th, and final, touchstone of human civilization. That would be a portable solar-powered lamp and charger which was selected as a harbinger of a day possibly not too far off when society runs on renewable energy such as the sun’s rays. “A History of the World in 100 Objects” created a formula for stodgy museums to excite the denizens of the Internet age. Museums across the world linked online to the British Museum exhibit and created similar programs in their facilities as attendance spiked. It was inevitable that a touring exhibit would be mounted but that too would require four years of preparation. “A History of the World in 100 Objects” reached Japan in 2015. After a run at the Tokyo Metropolitan Art Museum the exhibition has now docked at the Kobe City Museum until mid-January 2016. For those unfamiliar with the series the curiosities may appear mundane – many are truly everyday objects. But therein lies the profundity of their story. Take one of the Japanese objects in the exhibit. It is a clay pot hailing from the Jomon Period that thrived approximately 7,000 years ago. The clay pot represents the advancement of human diet. The Japanese artifact was one of the earliest vessels that could be used for cooking and storing food which meant more variety and nutrition on future menus. Visitors to the Kobe City Museum will not experience all 100 objects – about half were considered too valuable or too fragile for around-the-world traveling. But that does not dilute the power of “A History of the World in 100 Objects.” The original broadcast series was broken into twenty eras comprising five objects each to tell the tale of “Making us human” and “The first cities and states” and “status symbols” and more. That time line is still represented by the objects in the traveling exhibit. “A History of the World in 100 Objects” is at the Kobe City Museum until January 16, 2016. The museum’s website is only in Japanese although an English brochure of permanent exhibits can be downloaded. Open: 10:10 a.m. – 5:00 p.m. The most widely known amusement parks in Japan are of course Tokyo Disney Land and the Universal Studios Japan near Osaka, but did you know that after those two behemoths comes a resort that is right on our doorstep? Well, of course you do. You read the headline to this article! But yes, Nagashima Spa Land in Kuwana on the border of Mie and Aichi, is the third most visited amusement park in the country. In fact, with approaching 6 million visitors a year it is the 19th most most attended attraction in the world. The greatest draw is the main amusement park itself. Second only in size to the immense Fuji-Q, there are around forty rides and rollercoasters to raise the pulses of even the most hardened of daredevils. The daddy of them all is the Steel Dragon 2000 that, in its year of completion at the turn of the millennium, held the world record for speed, height, and track length (the so-called ‘triple crown’), the latter of which it still holds today. Other rides of note include the White Cyclone, the largest wooden roller coaster in the world and one of only five in Japan, as well as one of the Largest Ferris wheels in the country. 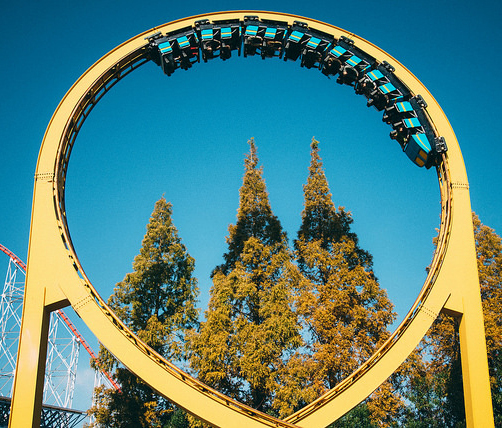 2015 saw the arrival of the Acrobat, a ride in which thrill-seekers lie down giving a ‘flying’ sensation, and at 1,021 metres is one of the largest roller coasters of this type in the world. Alongside the roller-coasters and rides is Joyful Water Park. Only open in the summertime (for obvious reasons) this open air water park is as filled to the brim with rides as its dry land neighbor. In fact it is so jam-packed that it is credited as being the densest – with more rides per meter – in the world. There are eight slides including tunnels, rafts, and the frankly terrifying banana slingshot ride that has to be seen to believed. As well as the rides there are three main pools including a wave pool and a hot onsen pool. Be warned though, on summer weekends it can get pretty packed with people, and it is imperative that you cover up any tattoos. Speaking of onsen pools, in Nagashima Spa Yuami no Shima they have one of the largest onsen complexes in western Japan. There are many types of baths that you can enjoy – hot, cold, warm, herb, Jaccuzi, even an electric bath with a mild current pulsing through the water! After a soak you can indulge in a shiatsu massage or dine at one of the restaurants. There is a hotel attached to the onsen, but access to the pools is not solely restricted to hotel guests. Just outside of the Joyful Waterpark is Mitsui Outlet Park Jazz Dream Nagashima. This outlet shopping mall has many international stores, from Moschino to Armani, from Timberland to Nike. Most stores are discounted from regular high street outlets, and during lunchtime many of them offer special reduced prices, so it may be worth putting off your meal until later. When you do decide to eat there are plenty of places to dine, with Bagel & Bagel being a personal favourite. If Joyful Waterpark is a big draw to the area in summer, then Nabana no Sato flower park is the reason that many visitors come in winter. Though it holds one of Japan’s largest flower festivals in the summer, it really comes alive in the colder months with a breathtaking illuminations display. Highlights include a light tunnel and a stunning representation of Mount Fuji that reflects the passing of the year on the great symbol of Japan. Wrap up warm and head to the observation deck for the best views of the park. If you have small children then you will perhaps not escape a trip to Nagashima without a tour of the Anpanman Museum. This attraction dedicated to the adorable character with bread for a head is located just outside the entrance to the amusement park and is packed with all things Anpanman. There are slides, a ferris wheel, people dressed up as characters from the show and, of course, a gift shop. Take a bus bound for Nagashima Onsen from the Meitetsu Bus Center next to Nagoya Station, and get off at either Nabana no Sato (870 JPY) or Nagashima Onsen (1030 JPY). Buses depart every 20 to 30 minutes. JR train to Kuwana Station. There two to three buses to Nagashima Onsen per hour (510 JPY). Another bus heads to Nabana no Sato (250 JPY, one to three buses per hour). If you have Japanese friends with young families, they will probably tell you about the clubs and associations that their children join – with the English school from age three, piano from four, judo from five, the list is seemingly endless. While this can seem like quite a lot for young children to handle, there are in fact many advantages for children taking part in multiple activities, particularly when we are living as expats. Things can be tough for us, living in a new country, finding our feet in a strange alien world. However, for children in this position, no matter how resilient they seem, this difficulty can be magnified, something to which I can attest from personal experience. Finding friends and new hobbies through out of school activities can certainly ease that transition. It also has the added advantage of helping us, the parents, meet others in similar positions. As part of the Helen O’Grady Drama Academy, Tokyo Bees is part of an internationally recognised brand. Operating in 26 countries it claims to be the largest provider of affordable school drama programs in the world. From the website: “Children will be involved in speech training, creative movement, mimes to music, story telling, songs, dramatic play and language activities. 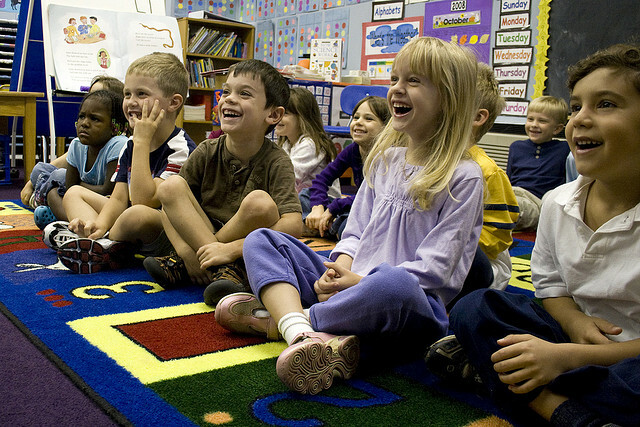 Children will learn how to interact in a group as well as to nurture their own individual talents and roles. This original international curriculum is extensive and highly creative and encompasses a 17 year cycle- so a child can come every week for 17 years and never repeat a lesson!” Tokyo Bees has classes for ages 3-12, and Children can start at any time of the year. There are a few music and dance associations around Tokyo. One of the best known is Crescendo Kids Studio in Shibuya. They use the Kindermusik movement and education program, developed for children aged two to seven. As well as music, there are also yoga classes for both children and mothers. In fact the social role of the parents is highly emphasized and encouraged. The Tokyo International Children’s Choir (TICC) was formed in 2012 and is open to all elementary and middle school children. English is the predominant language spoken in amongst choristers, however the songs themselves can be in a multitude of language. While performances are conducted in St Paul’s Lutheran church, the choir is a non-religious organisation and sing a variety of music from diverse cultural traditions, including classic choral works stemming from Christianity (e.g Bach, Handel) and secular works drawn from Broadway, pop and folk music. As Pablo Picasso once said, “All children are artists. The problem is how to remain an artist once he grows up.” In Japan, a country which loves its anime and manga cartoon from infancy to adulthood, this is perhaps more true than anywhere. Artist and writer Divya Marie Kato can help your child – and perhaps even your own inner child – realise their creative ambitions. Riko Fujimoto of Fujimoto Piano Studio has taught piano in both Japan and ther US. From her studio in Suginami she teaches both Japanese and English speaking students and runs courses from the early childhood development ‘baby course’ to professionals. You can take a trial lesson for 2,000 JPY, though quite why this is double the price of a trial lesson taken in Japanese, I’m not sure. Please note that the above out of school ideas are just for information purposes and none are endorsed by Japan Info Swap or the H&R Group K.K. Before arriving in Japan you should know that most bank ATMs in Japan will not accept credit, debit or ATM cards that were issued outside of Japan. If you are unawares this could leave you without access to money after arrival. No cash could be a problem, but with some knowledge and planning you should be able to access your money. The ATMs most commonly used to access international accounts are in post office branches and 7-Eleven convenience stores. At these locations you can withdraw cash using most credit and debit cards, even those issued outside of Japan, and the machines usually offer an English menu for your convenience as well. When looking to withdraw cash in Japan from an account overseas you are most likely to do so at a Japan Post Office branch or 7-Eleven convenience store, but the most commonly used ATMs are not the ONLY locations to access your funds; “international ATMs” can also be found at international airports, and at Citibank, and Shinsei Bank branches as well, though they are much less common. Verify your card can be used overseas. Some cannot! Ask about any fees or withdrawal limits on cards used overseas. Even if you are able to use it, is it economical? Inform them that you will be overseas. Many banks will deactivate cards used overseas without warning over fears of credit card fraud. There is nothing easier or more delicious in winter than a big clay pot brimming with natural ingredients. Nabe, or nabemono refers to a Japanese style of one-pot cooking, typically done at the table, bringing the family together to share a warm, healthy meal. Because each person takes what they want from the pot, it is an easy meal for mothers to serve fussy children without leftover food, and basically every ingredient is a health shop in itself so it’s a simple way to provide quality nutrition to a hungry family. Preparation is easy! Chop and boil the ingredients. Many more ingredients are added as you go, at the table. This means that most of the preparation is a fun family effort. Nothing that goes into a nabe isn’t healthy (unless you put it there!). Nabe warms you from the inside, so you don’t have to crank the heat up in your house. It can be as fat free as you want it, and you can drink the soup too so no nutrition is lost. Nabe only improves over time, so you can use the soup stock several days running, reinventing the style for variation. Firstly and most importantly for the true nabe style, you’ll need a means of cooking the meal on your dining room table. There are two ways you can do this. The more traditional method is to purchase a little one-burner gas stove which runs on cylinders of gas. These are called “kaseto konro, or カセットコンロ, ガスコンロ.” You can find a selection of them here on Amazon. You will then need a clay pot, a “donabe or 土鍋,” literally “earthenware pot, for use over an open flame in the Japanese kitchen. You can find one at any home centre or department store, especially during winter months. You can find a selection of them here on Amazon. A more modern alternative to the gas burner is an induction heater, which runs on electricity. If you choose this method you will have to be more careful about the type of pot you use, as a common clay pot will not conduct the electricity needed for the IH heater to work. There are however special converted IH donabe that will do the trick, or you can use any pot made out of a conducting metal. Not very traditional and far less popular, but far less likely to burn the house down as well. Oshibori – a damp hand towel for each person eating, is a good idea. Now that you’ve gathered the tools, it’s time to go to the supermarket. You can make your nabe out of literally anything, but it’s good to start with an idea of the kind of nabe you want. If you want to take a short cut, you can start by choosing a pre-prepared nabe soup mix, which you’ll be able to find in the same section of the supermarket where nabe ingredients such as fish, are sold. Yose Nabe – literally means “whatever you want to put in it” nabe – a very versatile stock for all ingredients. Kimchee Nabe – this Korean base is great for ingredients such as tofu and pork. It can be as spicy as you like it, if you add extra kimchee. Tohnyuu (soy milk) Nabe – great for mild tasting ingredients such as vegetables and chicken. Chanko Nabe – This nabe was traditionally used for sumo wrestlers and is suitable for high-protein, high calorie ingredients such as chicken drumsticks. Kaki (oyster) Nabe – Oysters add a wonderful flavour to the nabe, and can even be used the next day if measures are taken to make sure the oysters are OK (see below). Kani (crab) Suki – Crab is also a wonderful flavour for a nabe, and adds another dimension to the family meal if you use real crab legs – messy but fun! Ito konnyaku – made from potato startch, these long black (or white) noodles are a great addition to any nabe. You can also use the non-noodle forms of konnyaku. Tofu products – the firmer styles of tofu will hold their shape better, but any form of tofu will add flavour and nutrition to your nabe. Fukuro – Fried tofu bags filled with mochi or vegetables. Sato imo – mountain potatoes have a great texture and taste wonderful. They are sometimes called “magic potatoes” in english for their healthful qualities. You can get them frozen too, if you don’t want to bother with the process of peeling the hairy skins. Daikon – long white radish – the tops are better used grated in salads and the bottoms are great for nabe, either grated or just roughly cut up. Hakusai – Chinese cabbage – long, pale green leaves, this goes in any kind of nabe. Negi – leek or spring onion goes great in any form of nabe. Mushrooms – enoki, eringi, shiitake – any kind of mushroom gives flavour and aroma to the nabe. Anything leafy – try anything with leaves in the vegetable section of your supermarket – it’s bound to be a delicious addition to the soup! You can find a selection of “nabe no moto,” or soup base for nabe pot cooking on Amazon.co.jp here so you can get an idea what to look for in the grocery store. A word on keeping the nabe fresh for the next day – most of the time you will not need to refrigerate ingredients if you just boil them a couple of times before you use it again. For example, boil the nabe in the morning after you get up, and then once again that night before you are going to eat it. Refrigerate extreme perishables like oysters if the temperature in your house is high. Eat as many of the ingredients as you can the first night of the nabe, not adding unecessary ingredients you’re not going to eat that night. The wonderful thing about nabe is that it only gets better the second night, as the stock has had time to mature. On the final night, you might like to add udon noodles to the soup, or cooked rice to the soup to make delicious zosui (rice gruel). Zosui is the chosen food of sick people, because it is so mild to the stomach and is filled with nutrients, but healthy people find it just as delicious! Adding a beaten egg to this final mix and then cooking on very low heat with the lid closed will give the best finish to zosui, sticking the mixture together very nicely. Aichi Children’s Center’s “Kids Town” is a wealth of things to do for cheap in Nagoya with kids! Envisioned as a place where kids can “invigorate their minds and bodies, challenge themselves, find excitement, while thinking and feeling freely,” Kids Town is a place for children to find and create themselves through new experiences, play, excitement, and fun. Kids town does indeed offer a wealth of activities and areas for kids to explore, I mean these spots just sound fun, right? The Play Studio 1.2, Challenge Tower, Experience Zone “Kids Forrest,” Robot Theater, Kitchen Studio, and even a Picture Book Room. Check out the video on the very bottom of the page that gives you an idea of the view of the park available from the Observatory. The center offers many activities for children, but they are all in Japanese as far as I know. The center comes very highly recommend by many of in the foreign ex-pat community, and is a regular destination for families-especially in spring and summer. Why not take a trip out to the park, and see what all the fuss is about? Additionally, there is reportedly also a big pool with water slides, and an ice skating rink at nearby Morrikoro park as well, with a big green field to play in. The staff there put out jump ropes, hula hoops, stilts, and Frisbee for the kids to play with, and it is all just a short walk from the down the hill from the Children’s center.